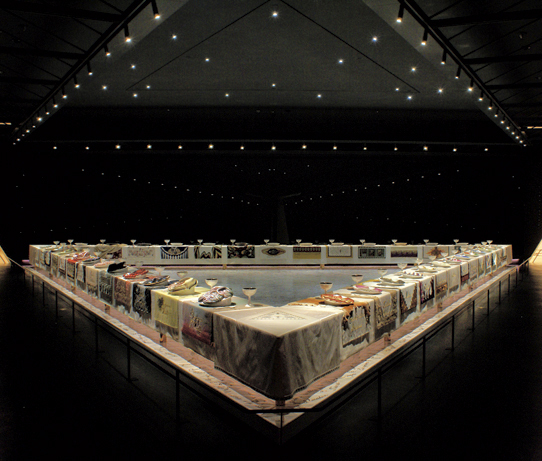 The Dinner Party by Judy Chicago is an icon of feminist art, which represents 1,038 women in history—39 women are represented by place settings and another 999 names are inscribed in the Heritage Floor on which the table rests. This monumental work of art is comprised of a triangular table divided by three wings, each 48 feet long. Millennium runners, silk coverings inspired by altar cloths, fit over the apexes of the table. They are embroidered in white thread on a white ground, each with a subtle letter “M,” as it is the thirteenth letter of the alphabet, signifying the break in each group of place settings. Arranged chronologically along the wings are thirteen place settings; each includes a unique runner and plate, as well as a chalice, napkin, and utensils. Wing One of the table begins in prehistory with the Primordial Goddess setting and continues chronologically with the development of Judaism, to early Greek societies, to the Roman Empire, marking the decline in women’s power, signified by the Hypatia plate. Wing Two represents early Christianity through the Reformation, depicting women who signify early articulations of the fight for equal rights, from Marcella to Anna van Schurman. Wing Three begins with Anne Hutchinson and addresses the American Revolution, Suffragism, and the movement toward women’s increased individual creative expression, symbolized at last by the Georgia O’Keeffe place setting.